As long distance runners we're always looking for something that's healthy, tastes not too bad and will fill up our hollow stomachs! 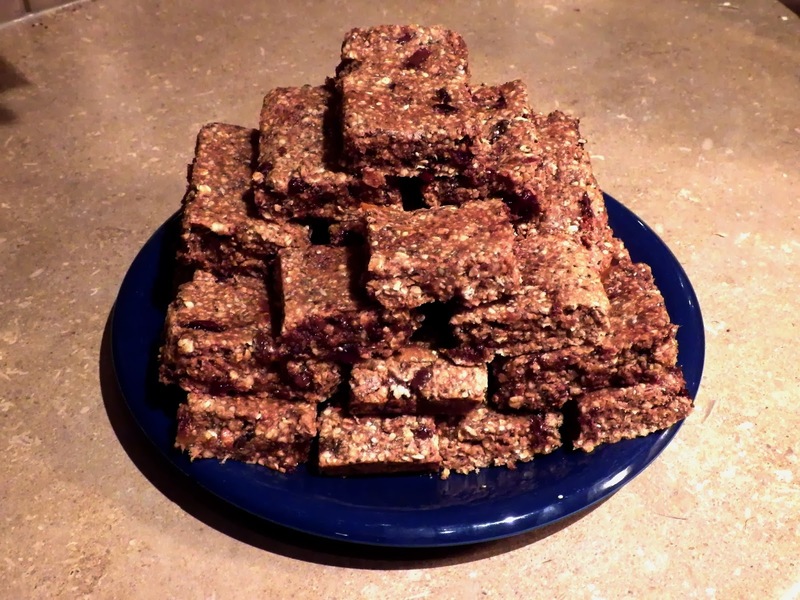 These Super Bars are truly amazing as an afternoon snack or while out on a run. They're loaded with energy from the fruit and oats and have a good amount of protein from the peanut butter and almonds. Plus they're bursting with flavor and are totally customizable! 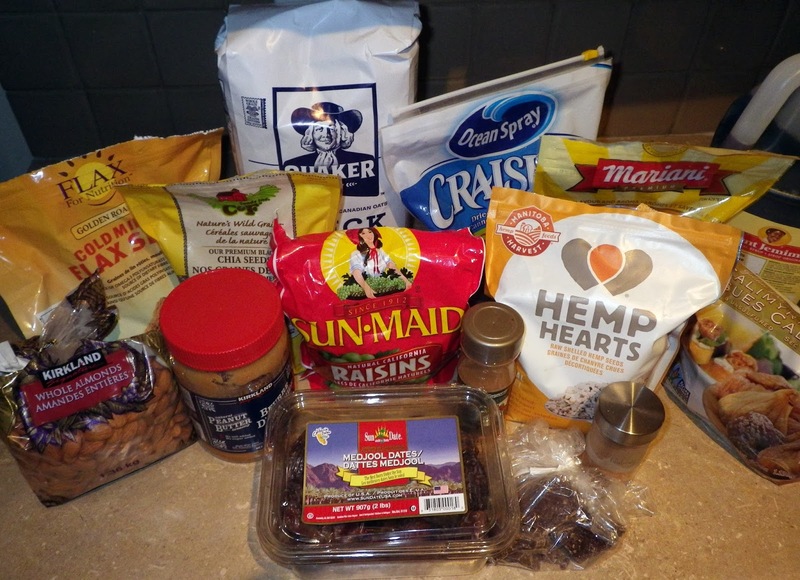 The recipe comes to us from Scout, a fellow ultra runner. We made a double batch here so that's why the quantities in the pictures are so large. All our ingredients laid out! Ready to mix everything together! *For this batch we used a combination of : raisins, cranberries, dried apricots, dates, figs, almonds, callebaut chocolate, chia seeds, hemp hearts and ground flax seed. That's all in the measuring cup on the right in the photo. The left bowl contains the PB and syrup, and the middle bowl has the oats and flour. Just going into the oven! Mix syrup and peanut butter until well blended. Stir liquids into oats and flour, then add in remaining ingredients. If mixture seems too dry, add water 1 teaspoon at a time. If it is too sticky, add oats 1 teaspoon at a time. Mixture should be slightly sticky, but still easily spread in a pan with greased fingers. You'll want to get out your industrial strength wooden spoon for this one! Press into a 9 x 13 inch (23 x 33 centimeter) pan lightly greased. All cooked, cooled and ready to eat! really only take about 15 minutes to brown, depending on your oven. Score them after you take them out of the oven, to make cutting them easier. When completely cool, cut where you’ve scored the bars and remove from pan with a spatula. Cut into whatever size you want for running or snacking! Wrap, or container them, and store in fridge. If you wrap them well you can freeze them. I suggest wrapping them in saran then storing in a well-sealed container or Ziploc-type bag. Enjoy these on your next long run or hike, or anytime as a (mostly) healthy snack!